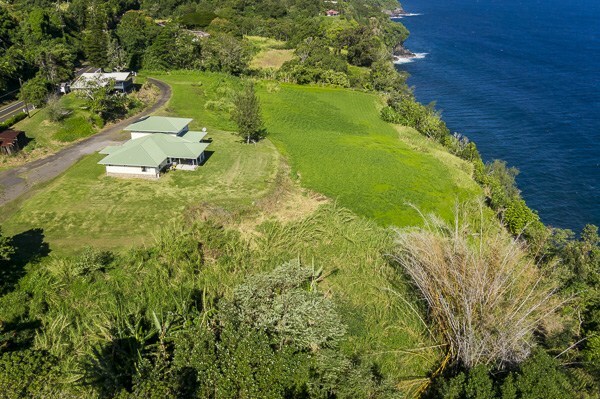 With gorgeous Pacific Ocean views, a gourmet kitchen, and spacious living areas, this two-story, like new Ninole home tucked in along the Hamakua Coast offers Hawaii living at its best. What’s more, it comes with the opportunity to purchase the large oceanfront lot directly in front of it. Exceptional in its own right, this near-oceanfront property features a spacious home with stunning views; the adjoining 2.5-acre property on the oceanfront is also for sale. Built in 2010, this property (MLS# 270529) features 4 bedrooms and 2.5 baths. Sitting on 1.94 acres of nearly oceanfront land, both bedrooms on the second floor, as well as the master suite and bonus suite downstairs, offer ocean views. There’s a lot to like about this house. With 2,171 square-feet of living space, there’s plenty of room for everyone. 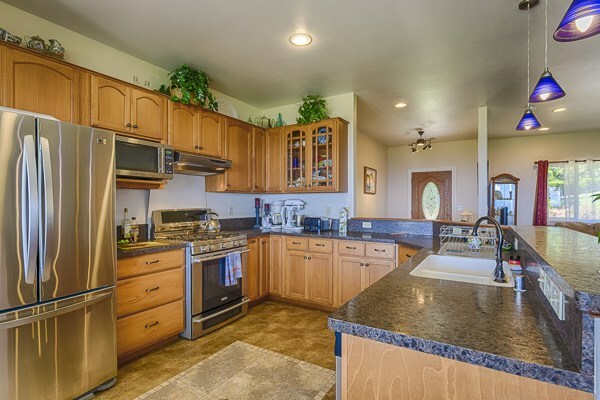 The gourmet kitchen is a chef’s delight featuring lots of counter space and quality stainless steel appliances. The large gourmet kitchen features stainless steel appliances, plenty of counter space, and gorgeous ocean views. 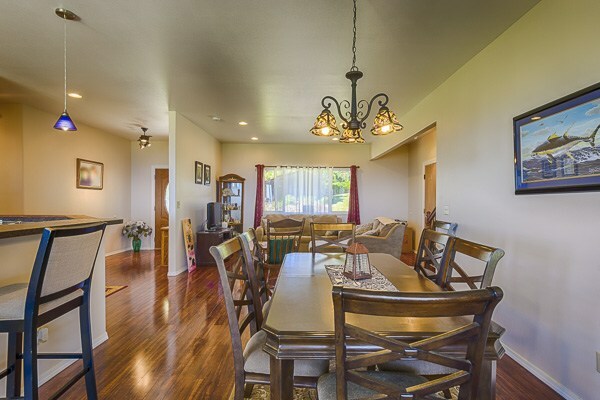 There’s also ample room for entertaining with a breakfast bar, a built-in breakfast nook, AND a spacious dining room. Even better, each of these areas offers magnificent ocean views. Enjoy your morning coffee and watch whales and dolphins swim by. Or relax with friends and loved ones on the covered lanai looking over your spacious backyard and views of the coastline. Those seeking privacy will appreciate that this house is off Mamalahoa Highway and feels secluded. 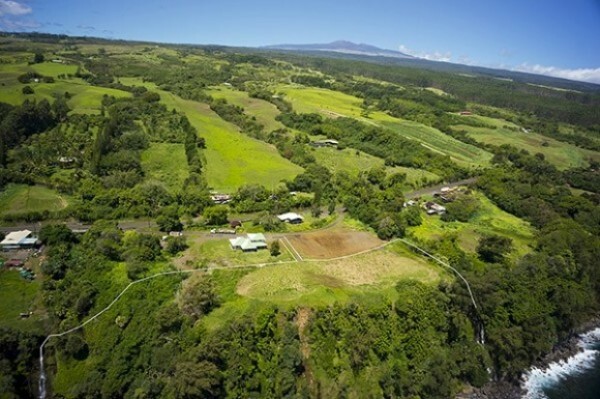 With its relaxed lifestyle, yet close proximity to the economic hub of Hilo, Ninole is a much sought-after community along the Hamakua Coast. Check out my previous blog post about the benefits of living in Ninole. What makes this property unique is that potential buyers have the opportunity to purchase the 2.5-acre oceanfront lot directly in front of it. I’ve written previously about this exceptional Ninole oceanfront property, which includes two waterfalls and 765 feet of uninterrupted oceanfront. The sellers would like to sell both properties together. Its not often there’s an opportunity to purchase two adjacent properties together like this. Purchasing both parcels allows for a tremendous amount of possibilities! Combine both properties to create a large, luxurious Hawaii oceanfront estate with waterfalls at either end of the property. Or build a home on the oceanfront parcel and use (MLS# 270529) as rental income. The spacious near-oceanfront home (MLS# 270529) is offered at $595,000, and the vacant oceanfront lot (MLS# 255393) is offered at $385,000. For information on these and other properties, give me a call today at (808) 963-6880 or email BeverlyMolfino@ElitePacific.com.